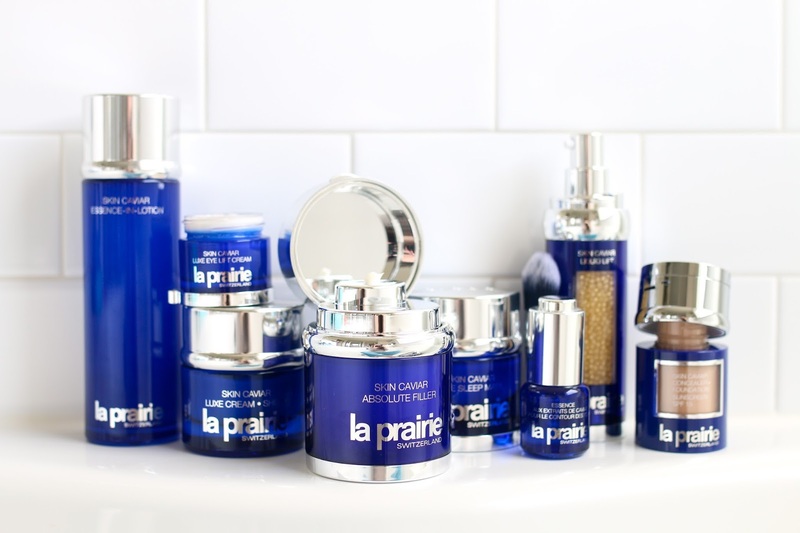 I've been a regular user of the La Prairie Skin Caviar line for a few years now (read previous posts here, here, here, here, here and here) and find that the products are so effective at targeting anti-aging concerns. Of course, there are additional benefits depending on the product (hydrating, brightening - I even notice that my pores appear minimized when using this regularly) which is what makes it a skincare line that has stuck with me for quite a long time. 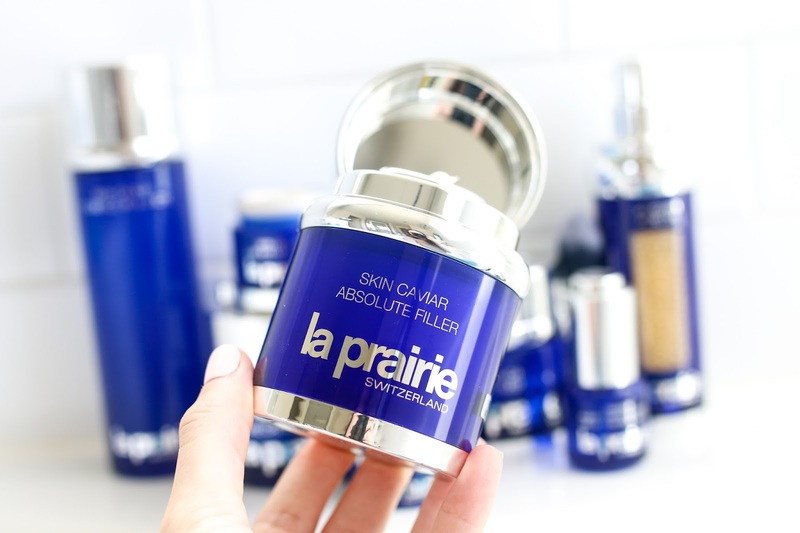 The newest addition is the La Prairie Skin Caviar Absolute Filler, a moisturizer designed to enhance volume in the skin with an emphasis on tone and density. Basically it helps to make the skin look more full, contoured and firm over time. For me, the first thing I began to notice while using the Absolute Filler was my skin definitely took on a more firm and contoured look with the most noticeable difference being along my jawline. My cheeks also had a more firm and full appearance after using for a few weeks which gave my skin a more overall youthful look. Since the texture is quite rich, I was thinking this would only work for the evening, but after trying it a few times during the day it absorbed beautifully and made my skin look supple and taut under makeup. This is definitely a product targeted towards more mature skincare aging concerns and would provide the most benefits to someone who struggles with loss of firmness, density or volume in their face. While many of the other Skin Caviar products can span many age ranges, I think this is best targeted towards a more mature consumer. Skin Caviar Essence-in-Lotion - This is probably in my top 3 favorite products from the range. It delivers insane hydration to the skin, plumps, firms and even helps to minimize the appearance of large pores. Along with this decadent essence and this cult classic, it is one that I recommend if you want to splurge on an essence for your routine. Skin Caviar Luxe Eye Lift Cream - Dry eyes are no match for this eye cream - holy cow! I only need the smallest amount, but it delivers the most comforting and nourishing feeling on the skin when applied. I have pulled this back out now that my skin is so dry from pregnancy and it is has helped immensely to reduce the discomfort I feel around my eye area. Skin Caviar Eye Essence - This was the first eye product from the line that I tried and the one that gets the most buzz. This firms and tightens the eye area like no other product I have ever tried! I can actually feel it tightening immediately upon application and my under eye area looks instantly smoother. The hype surrounding this eye essence is well deserved. Skin Caviar Luxe Cream Sheer - Most of the products in the Skin Caviar range are quite rich in texture, delivering intense hydration and for certain skin types may be too heavy. The Luxe Cream Sheer is incredibly nourishing, designed to help address firmness and elasticity but with a much more lightweight texture. Skin Caviar Luxe Sleep Mask - While it is technically called a sleep "mask", I use this as a night cream. I apply it last in my nighttime skincare routine and find that it really helps to replenish the skin overnight. It also addresses concerns of firmness and sagging skin but for me I find that my skin looks so rested and refreshed the next morning. While there are no exfoliating properties in the product, I do find that my skin feels much smoother, retexturized and more radiant the next morning when using regularly. Skin Caviar Liquid Lift - This serum battles with the Essence for top spot in my favorite products from the Skin Caviar line. I have been using the Liquid Lift for a few years and while it is technically designed to help lift and firm the skin, I find it does wonders for helping my skin appear more even toned, smoother and pores minimized. It's one of the serums that I can consistently go back to and always get the same great results for however long I use it. Skin Caviar Concealer + Foundation - I was so happy when they launched this foundation because while it is still pricey I find that it's a better entry point into the range for someone that wants to dip their toes in the Skin Caviar experience. The foundation gives beautiful coverage (medium that can be built up to full), leaves the skin looking radiant and fresh and because of the skincare benefits contained in the formula will help the skin look firmer and more lifted over time. There is also a concealer in the top of the cap which gives insane coverage so in essence, you are getting two products (foundation/concealer) in one which helps people justify the price a bit more. The Skin Caviar range is definitely designed for the luxury skincare lover, and most of the products are targeted at addressing very specific anti-aging concerns. However, there are a few pieces in the range that are great to add in for any age and skin type such as the Essence-in-Lotion, the Eye Essence and either the Sleep Mask or Foundation for a larger splurge. 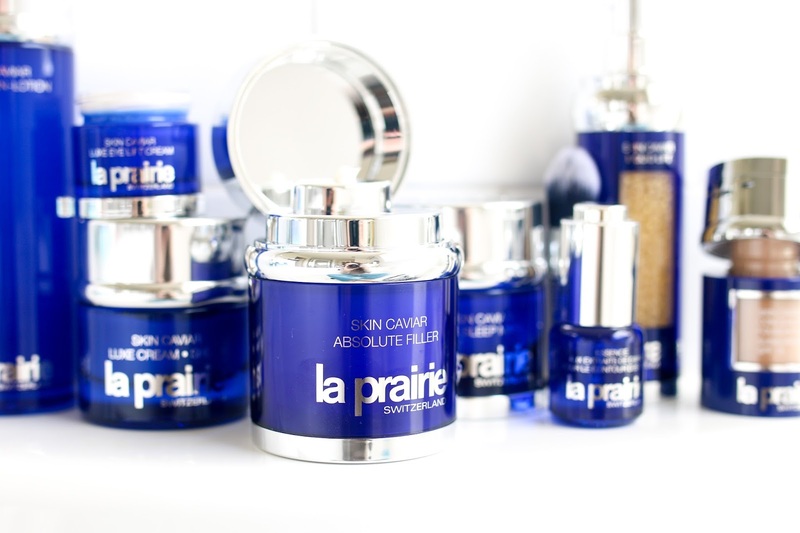 What are your favorite La Prairie products?! Would love to hear your recommendations!